We’d love your help. Let us know what’s wrong with this preview of First Family by Joseph J. Ellis. The Pulitzer Prize-winning, best-selling author of "Founding Brothers" and "His Excellency "brings America's preeminent first couple to life in a moving and illuminating narrative that sweeps through the American Revolution and the republic's tenuous early years. John and Abigail Adams left an indelible and remarkably preserved portrait of their lives together in their pers The Pulitzer Prize-winning, best-selling author of "Founding Brothers" and "His Excellency "brings America's preeminent first couple to life in a moving and illuminating narrative that sweeps through the American Revolution and the republic's tenuous early years. Ellis describes the first meeting between the two as inauspicious--John was twenty-four, Abigail just fifteen, and each was entirely unimpressed with the other. But they soon began a passionate correspondence that resulted in their marriage five years later. Over the next decades, the couple were separated nearly as much as they were together. John's political career took him first to Philadelphia, where he became the boldest advocate for the measures that would lead to the Declaration of Independence. Yet in order to attend the Second Continental Congress, he left his wife and children in the middle of the war zone that had by then engulfed Massachusetts. Later he was sent to Paris, where he served as a minister to the court of France alongside Benjamin Franklin. These years apart stressed the Adamses' union almost beyond what it could bear: Abigail grew lonely, while the Adams children suffered from their father's absence. John was elected the nation's first vice president, but by the time of his reelection, Abigail's health prevented her from joining him in Philadelphia, the interim capital. She no doubt had further reservations about moving to the swamp on the Potomac when John became president, although this time he persuaded her. President Adams inherited a weak and bitterly divided country from George Washington. The political situation was perilous at best, and he needed his closest advisor by his side: "I can do nothing," John told Abigail after his election, "without you." To ask other readers questions about First Family, please sign up. Before Bill and Hillary took to the White House, or Al and Tipper inspired Love Story, in a pre-Brangelina world (if one can imagine it), there was another power couple, John and Abigail Adams. This is a portrait painted primarily through the letters between John and Abigail, with careful attention paid to the irony that we know the least about the times during which they were together. 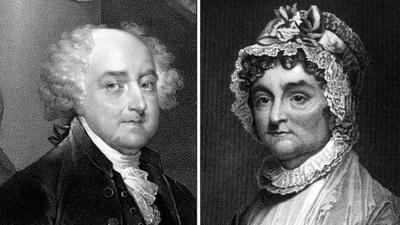 Luckily for us (not so much for the wife and kids), John's time was often dominated by his political duties a Before Bill and Hillary took to the White House, or Al and Tipper inspired Love Story, in a pre-Brangelina world (if one can imagine it), there was another power couple, John and Abigail Adams. This is a portrait painted primarily through the letters between John and Abigail, with careful attention paid to the irony that we know the least about the times during which they were together. Luckily for us (not so much for the wife and kids), John's time was often dominated by his political duties and featured a lengthy (we're talking years) stint as a diplomat abroad. Thus, what Joseph J. Ellis calls the "paradox of proximity," isn't too much of a handicap. The tone and topics of their correspondence range from gag-worthy lovey-dovey lines during their courtship, to diatribes on the behind the scenes political dealings in France, and the occasional chastising word from Abigail re. John's shortcomings as a parent. Abigail's political and intellectual astuteness are of particular importance given John's resistance to party politics, and the tricky dynamics of internal governmental dealings when the position of vice president went to whoever came in second, and the appropriateness of the use of executive power to pick and choose and oust cabinet members. The trying melée and scandals of the young republic are all there. A line from Jim Butcher's Storm Front I came across seemed to fit well, "just because you're paranoid doesn't mean that there isn't an invisible demon about to eat your face." Maybe there weren't any face-eating demons, but there was more than enough paranoia and betrayal to go around. 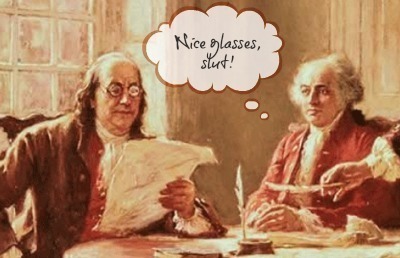 In his twilight years, it seemed all too appropriate that John envisioned debating Franklin in the hereafter. However, the one who he most hoped to encounter once more was, of course, Abigail. This is an easy read, a lightweight biography of Adams with a focus on his relationship with Abigail. I read McCullough’s book several years ago and this was a pleasant refresher. I enjoy Ellis’s engaging style. It’s written from a fond perspective, but he does not gloss over Adams’s faults and mistakes. I admit to a certain bias: Abigail and John Adams are my favorite historical couple. But this book sheds further light on why they worked so well together, focusing on their relationship based on their correspondence (the largest collection of letters from any presidential couple). Abigail, brilliant, fiery, and domestic, was often left alone to run the farm and raise the children. John was often away on political business, at the mercy of his own ambitions and temperamental mood swings. Somehow, I admit to a certain bias: Abigail and John Adams are my favorite historical couple. But this book sheds further light on why they worked so well together, focusing on their relationship based on their correspondence (the largest collection of letters from any presidential couple). Abigail, brilliant, fiery, and domestic, was often left alone to run the farm and raise the children. John was often away on political business, at the mercy of his own ambitions and temperamental mood swings. Somehow, they balanced each other. I was keenly interested in the way the Adamses and their children related to each other, but I also learned a great deal about how John Adams related to his fellow politicians: to put it rather bluntly, badly. The heated grudges with Benjamin Franklin and Thomas Jefferson were eye-opening, and the resolution of the latter as Adams and Jefferson finally made peace after decades of mistrust (and more than a little backstabbing) was practically cinematic. This is history for me: the story of real people in extraordinary times. Well-written, well-researched and cited, and an excellent read. I thoroughly enjoyed the audio version of this book, and felt the reader did an excellent job. I appreciated the authors ability to put one back into the 1700's, and also link it to the differences of today. One of the things I came away with is how sad it is that a beautiful language has gone the way of the dinosaur, not to mention the art of letter writing. Omg, if this generation did rite ltrs, they might not be quite so intrstg. Idk? It was pretty incredible that Mr. Adam's had so much foresi I thoroughly enjoyed the audio version of this book, and felt the reader did an excellent job. I appreciated the authors ability to put one back into the 1700's, and also link it to the differences of today. 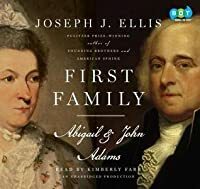 “First Family: Abigail & John Adams” is the most recent of nearly a dozen books by Joseph J. Ellis. Mr. Ellis is a Professor of History at Mount Holyoke and has written extensively on the revolutionary era and some of its most prominent figures. 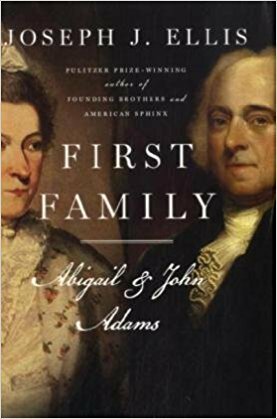 ”First Family” is the last of a seven books in my library on John Adams, and is the only one whose focus is not principally on the former president, but on both John and his exceptional wife Abigail. Fortunately for posterity, Abigail and John were prolific writers, exchanging more than 1,200 letters with each other and leaving historians a treasure trove of insight into their relationship and how they perceived the dynamic, revolutionary and turbulent world around them. They were no less productive in writing others as well: friends, other family members and numerous politicians of the day. Together with the diary John Adams kept, these documents provide nearly unmatched access into the lives of two important members of the revolutionary era. Although I expected this book to be quite unique compared to previous biographies of John Adams that I’ve read, in truth it is not. Several of the earlier biographies did focus significantly on John’s relationship with Abigail – whether by virtue of her keen and perceptive insight, her impressively articulate letters (particularly for an “uneducated” woman of her times), her propensity for sharing her views on politics with her husband, or her ability to counterbalance John’s “eccentricities”. So the focus of this book, while unusual in its apparent single-mindedness, was not unique. In addition, “First Family” proves much less narrowly focused on John’s relationship with Abigail than I expected (based on the title, if nothing else). This book is not the relationship analysis one might expect if reading the notes from their marriage counselor, had there been one. Instead, this is essentially a slimmed-down biography on both Abigail and John Adams, beginning with their introduction to each other in 1759 (at the age of 24 for John, and 15 for Abigail) and terminating with John’s death on July 4, 1826. Although its theme clearly centers around this fascinating couple’s relationship, the reader is quite well-introduced to the broader political and social context of the era during the book’s 250 or so pages. In fact, for someone with little previous knowledge of John Adams, his enormous contribution to the Continental Congress, his role as a diplomat and part-time financier in Europe, his eight years as vice president or his term as president, “First Family” provides almost as good an introduction to those years as much longer John Adams biographies. So although I had expected to come away with a much richer understanding of the John/Abigail relationship, any disappointment seems due to the earlier biographies being more thorough in their treatment of the relationship than I had expected. However, I was struck with how well this book not only analyzes their relationship, but also serves as a precis of John Adams’s life generally, giving short shrift only to the years before he and Abigail met. Some reviewers have questioned Ellis’s commitment to leaving unsubstantiated opinions – disguised as fact – out of his text. While I was sensitive to this criticism, I saw little evidence that the worst fears of those critics filtered into this book. At several junctures, Ellis points out that “we can never know for sure…” and goes on to surmise what may have happened, may have been said or what someone may have felt on the basis of the author’s opinion. These occasions are clearly recognizable and leave the reader with ample caution to distinguish fact from presumption (or even fiction). In addition, other reviewers have criticized the book for numerous minor errors it contains such as attributing incorrect dates to certain events, but where neither the date nor the event are critical to the story (such as the date of the end of the First Continental Congress). These shortcomings, where they do exist, are certainly troublesome – particularly to the historian and the more “academic” readers. That they may have come from the pen of a professor and noted author is even more unfortunate. But the average reader will likely find no quarrel with, nor even recognize, them. Overall, “First Family: Abigail & John Adams” is a relatively short and remarkably interesting book. It serves not only as an introduction to the remarkable relationship between Abigail and John, but also as a summary of pre-revolutionary America, the revolutionary years (largely from the perspective of a member of Congress locked in a Philadelphia meeting room most of those years, then shipped to France to negotiate peace), and the first twelve years of the US presidency. Although this book is neither the best biography of John Adams, nor as extensively focused on John’s relationship with Abigail as I had wished, it does both quite well and in fewer pages than others. For readers interested in exploring Abigail’s and John’s relationship in greater detail, two books I have not read but which have been highly recommended include Woody Holton’s “Abigail Adams” and Edith Gelles’s “Abigail and John: Portrait of a Marriage”. They will appear on my bookshelves shortly (though reading them may have to wait for the presidential journey to first run its course). Let me preface by saying that I am a complete newb at American History. As such this was my first journey into a detailed account of our Founding Fathers and the machinations (both domestic and foreign) that lead to the creation of the United States of America, under one Federal consistution, that we have today. With that caveat in place I have to say I enjoyed this book very much. Unlike the more historical fictional "John Adams" books this one reads a little more academic. Its much the same sto Let me preface by saying that I am a complete newb at American History. As such this was my first journey into a detailed account of our Founding Fathers and the machinations (both domestic and foreign) that lead to the creation of the United States of America, under one Federal consistution, that we have today. With that caveat in place I have to say I enjoyed this book very much. Unlike the more historical fictional "John Adams" books this one reads a little more academic. Its much the same story line (so I'm told as John Adams and the other books like it are on my "to-read" not "read" list)but its culled from the extensive letters that were exchanged during Abigail and John's lives, complete with copious citations and footnotes for those that want to know more. The author, Joseph Ellis, read through all 1,000+ letters between the Adams' family members, supplemented it with historical fact and presented a lovely portrait of how America went from a British Colony to its current government structure. While the story always stays square on the shoulders of the Adams' it is amusing to learn how they intersected with other American greats - Jefferson, Franklin, etc. For many this may be a rehash, but to me it was informative and educational all while being just entertaining enough to finish. I gave it three stars rather than four because I feel that the fourth star would have been added more as a fact of my own enlightenment of a major gap in my education rather than the book istelf. The first part of the book was sluggish for me, probably more because Mr.Adams’ work overseas was less interesting for me than what was accomplished on American soil. After that, it became a faster read and I was grateful for Mrs. Adams’ perspective on the many facets of her life and that of her family. But throughout the book, my interest was always held to how the personalities of other prominent historical men came alive in these pages as well. A very good read! This book offers a fascinating look into the lives, ambitions, and marriage of one of the foremost families of the Revolution era. I found it to be particularly fascinating because it isn't just a re-telling of their life - it offered a sort of "behind-the-scenes" look into their thoughts, attitudes, and motives through use of their copious amounts of letters and journals. As the reader, you aren't just walking through the events of their life, you're journeying into their heart. I also found th This book offers a fascinating look into the lives, ambitions, and marriage of one of the foremost families of the Revolution era. I found it to be particularly fascinating because it isn't just a re-telling of their life - it offered a sort of "behind-the-scenes" look into their thoughts, attitudes, and motives through use of their copious amounts of letters and journals. As the reader, you aren't just walking through the events of their life, you're journeying into their heart. I also found the book to be very well-written - the words and thoughts flow so nicely together that it made reading both easy and very stimulating. The book is about 250 pages with only seven chapters - so needless to say, the chapters can be lengthy. There are quite a few sub-headings in each chapter though so it's fairly easy to find a good stopping point. I haven't done much reading or studying on this family of the Revolution so I was very interested to learn more about them and they era they lived through. One of the main currents of the book (because it was also the main current of their lives) was the preoccupation with fame. John Adams didn't care to have spiritual goals or be consumed with the pursuit of wealth. "Mere worldly success in terms of wealth was never enough for him; indeed, it was actually dangerous, since wealth inevitably corrupted men and nations by undermining the disciplined habits that produced the wealth in the first place. Making wealth your primary goal, as he saw it, was symptomatic of a second-rate mind destined to die rich but unfulfilled." It was sad to see his relationship with his children. He was away most of their formative years and without the benefit of modern communication, they lacked a strong bond and friendship. His children lacked his fatherly guidance through much of their young lives. His two younger sons, though showing early promise, ended their lives in dissolution and lost to alcoholism. All the weight of carrying on both his father's mantle of fame and the great family name and legacy rode on the shoulders of their oldest son, John Quincy. Ironically, late in his life, the elder John Adams tried to dissuade his son from following in his footsteps that had led to such turmoil and dissatisfaction - but by then it was too late. I found the look into Abigail Adam's life quite intriguing. She wasn't confined to society's views of women. She was very educated and well-read for her day and she kept up with and understood politics better than most men of her day. She was an apt helpmate for John, readily able to understand and discuss any policy or opinion of the day. They were true partners together. She also tempered his personality when they were together - she knew how to handle his rantings and oftentimes overly-hard pursuit of fame and a good name. At the same time, Abigail fully embraced her role as wife and mother. She readily accepted her domestic duties and had to run both the family and her household and farm while John was away. At the same time, she never lost her opinionated mind or her personal independence that led her to do things her own way and not always be dictated to by society. While her parenting may not have been the best and her family later fell apart, I found her ability to fully embrace her roles as homemaker and wife while still retaining her personal opinions and individuality to be a great example. My favorite quote from the book came from Abigail Adams. "My pen is always freer than my tongue, for I have written many things to you that I suppose I never would have talked." As an introverted, reflective person that quote really resonated with me. I've often said similar things. If I didn't have the ability to communicate through written word, there would be a lot that I would simply find very difficult or impossible to communicate. For some reason it's easier to write than to talk for me. So I enjoyed that quote - I'm going to have to put it somewhere! 1776, a musical film which celebrates the Declaration of Independence, is an absolutely delightful movie, as funny as it is inspiring. But increasingly I enjoy it for the tender way it portrays the relationship between John Adams and his distant wife, Abigail. Committed whole-heartedly to the Revolution, Adams is its most ardent advocate. He struggles throughout the film against the cautious conservatism of his fellow congressmen, and even his marginal successes seem ruined by the compromises th 1776, a musical film which celebrates the Declaration of Independence, is an absolutely delightful movie, as funny as it is inspiring. But increasingly I enjoy it for the tender way it portrays the relationship between John Adams and his distant wife, Abigail. Committed whole-heartedly to the Revolution, Adams is its most ardent advocate. He struggles throughout the film against the cautious conservatism of his fellow congressmen, and even his marginal successes seem ruined by the compromises that were necessary to achieve them. In times of crisis, Adams retreats and finds a place to himself....where he finds consolation in the thought of his wife. Throughout the movie, Abigail appears in his thoughts and the two sing and comfort one another, the lyrics and dialogue being taken from their letters. It is those letters that provide the source of this, Joseph Ellis' lovely biography of the Adams family. Ellis proved in Founding Brothers that he's a gifted storyteller, and the same strength is at play here. It helps that he has such extraordinary characters to write about. Abigail is no prim and proper personality stifled by petticoats: she's strong, vibrant, and independence, giving as good as she gets in terms of political and philosophical conversations as well as sly innuendo that no one would expect from a couple living in Puritan country. She is in the truest sense of the word, Adams's partner; his dearest friend and most constant source of intellectual stimulation. Her interest in politics influences his career directly, and she takes an active hand in his personal and political relationships with men like Thomas Jefferson. The affection these two feel for one another -- the strength and power of their relationship -- is abundantly evident in their letters, especially when they are estranged during Adams' time as an diplomat in Europe. Abigail's role as confidant allows the reader to see inside Adams' mind, and the man revealed is endearing for his faults and fascinating in his beliefs. Adams' progressive realism contrasts with Jefferson's conservative idealism, and demonstrates the frailty of the false liberal-conservative divide. No man is so easy to box up. Although politics plays a large role given Adams' place in history as revolutionary leader and president, John and Abigail's family is never far from sight, and the losses they endure can't help but inspire sympathy. I thoroughly enjoyed First Family. To be sure, it does have the weakness of maintaining a one-sided view of the Revolution that sees Britain as entirely in the wrong; here, Britain is taxing America to pay for its empire just because it's fun to be oppressive like that. It's also not quite as varied as Founding Brothers, but even so I couldn't stop reading it. (The story of John and Abigail fairly well enraptures me: even though the Fourth is long past, the taste I had of their relationship in Sacred Honor and Founding Brothers only gave me an appetite for more, and I may wind up having to find and purchase a collection of their letters to find satisfaction!). It's a story of romance, family, and politics -- one which reveals the mind-boggling insanity of the Adams White House, where the second president is beset by friend and foe alike. Not only does his vice president conspire with the French and instruct them not to pay Adams any attention, but a member of his own party has Bonaparte-esque delusions of grandeur and tries not only to run the presidential cabinet in secret, but put himself at the head of an army he can use to root out spies and traitors....like the vice president. If nothing else, First Family demonstrates the remarkable pillar of contrarianism that was Adams more easily than David McCullough' denser biography might. "Knowing as we do that John and Abigail Adams were destined to become the most famous and consequential couple in the revolutionary era, indeed some would say the premier husband-and-wife team in all American history, it is somewhat disconcerting to realize that when they first met in the summer of 1759, neither one was particularly impressed by the other (p. 3)." "For both of them, love entailed a level of intimacy that no conversation could completely capture and required a physical attraction. And they both felt it... an emotional affinity that made unconditional trust between them a natural act (p. 5)." "Letter writing in the eighteenth century was a more deliberative and self-consciously artful exercise than those of us in the present, with our cell phones, e-mail, and text messaging, can fully fathom. The letters, of course, are all we have to recover the texture of their overlapping personalities. While they constitute a long string of emotional and intellectual pearls unmatched in the literature of the era, they were also self-conscious performances, quasi-theatrical presentations that were more stylized and orchestrated than real conversations (p. 7)." "There is indirect evidence to believe that Abigail's mother opposed the marriage, convinced that her daughter was marrying down and could do better (p. 8)." "Reading was a chief form of rebellion. Her father owned an impressive library containing most of the classics in literature, history, and religion. Her interest in Milton, Pope, Dryden, and Shakespeare became a source of pride rather than a worrisome concern (p. 13)." "John was extremely prolific during the next decade, publishing between twenty-five and thirty essays that challenged Parliament's right to tax the colonies and, eventually, to legislate at all for them. One could argue that Abigail was equally prolific during this time, laying the biological foundation for what would eventually be called the Adams dynasty. John's political writings dominate the historical record of their lives together at this time... there are very few letters offering a window into Abigail's domestic world (p. 22)." "Though there was no way of knowing it at the time, John's departure for Philadelphia launched a new chapter in the marriage that paralleled a new chapter in American history, soon to be called the American Revolution. For the next four years, Abigail and John would be apart much more than they were together (p. 31)." "Abigail claimed that she was more forthcoming in her letters than she would have been in face-to-face conversations: 'My pen is always freer than my tongue…for I have written many things to you that I suppose I never would have talked (p. 31).'" "Political opinion in Massachusetts had moved much further toward the prospect of American independence than in the other colonies. This made eminent sense, since only Massachusetts had been placed under martial law and made to suffer the indignity of occupation by the British army. But what was a mainstream position in Boston was regarded as extremist in Philadelphia.... The ideological convictions that John brought to Philadelphia were fundamentally incompatible with the agenda of the moderates (p. 36)." "The political crisis had escalated to a military conflict, and its epicenter was the Boston area.... Little John Quincy never forgot what he saw that day. And in his reminiscences…he recalled the abiding sense of fear that his mother and siblings lived under for several weeks because of British foraging parties and various bands of marauders taking advantage of the lawless conditions (p. 40)." "John Quincy, for all his intellectual sophistication and political achievement, was not a happy man, lacked the emotional spontaneity of his father, and seemed to regard laughter as an unnatural act.... the salient question is unavoidable: Did the absence of a father stunt their emotional growth (p. 43)?" "Throughout the remainder of John Quincy's quite extraordinary career, his father embodied a combination of public and personal probity that verged on the superhuman…by constantly reminding John Quincy that he was a gifted child who would disappoint him if he somehow squandered his talent, an appropriate warning to a young adult, but an emotional millstone for a ten-year-old (p. 44)." "Sitting as she was within cannon range of the battle raging around Boston, it was difficult for Abigail to understand the reluctance of the Continental Congress to recognize that the war for American independence, though not officially declared, had already begun (p. 47)." "While Abigail's arguments about women's rights proved to be a couple of centuries ahead of its time, her recognition that the very arguments her husband was hurling at Parliament and the British ministry had latent implications that undermined all coercive or non-voluntary systems of arbitrary power called attention to the Pandora's box that John and his colleagues in the Continental Congress had opened.... Abigail continued to press for expanded rights for women: 'If we mean to have Heroes, Statesmen and Philosophers...we should have learned women,' because mothers would be most responsible for educating the rising generation (p. 50)." "'The Second Day of July 1776, will be the most memorable Epocha, in the History of America. I am apt to believe that it will be celebrated, by succeeding Generations, as the great anniversary Festival. It ought to be commemorated, as the Day of Deliverance...It ought to be solemnized with Pomp and Parade, with Shows, Games, Sports, Guns, Bells, Bonfires and Illuminations from one End of this Continent to the other from this Time forward forever more.' John got everything right, including the fireworks displays, but he got the date wrong because he thought the vote on independence more symbolically significant than the vote on the Declaration two days later (p. 53)." "Once July 4 became the acknowledged date for America's birth, credit shifted from Adams to Jefferson (p. 54)." "The celebratory mood of early July was now replaced by the somber recognition that it was going to be a long war (p. 57)." "It never occurred to John to refuse the appointment, an option Abigail probably preferred but never felt she could insist upon, knowing as she did that John would feel obliged to grudgingly concur, then hold it against her the rest of their lives. For while John was unquestionably an American patriot, he was also obsessed with claiming a prominent role as an architect of American independence, and the last thing Abigail would ever do was to become an obstacle between her husband and his fondest dream (p. 68)." "Approximately one-fourth to one-third of the letters Abigail and John wrote to each other in 1778-79 ended up on the ocean bottom (p. 70)." "'The affection I feel for my Friend is of the tenderest kind, matured by years, sanctified by choice and approved by Heaven (John, p. 71).'" "If Abigail's major problem during John's eighteen-month absence was a pervasive sense of loneliness and neglect, his was quite the opposite.... He was feted and fussed over from the moment that he and John Quincy landed at Bordeaux (p. 73)." "Domestic concerns…could not compete with his craving for public distinction (p. 83)." "Alone once again in the house, Abigail was miserable. If she had known that this separation would last for nearly five years, her misery might have been unbearable (p. 84)." "Patience never came naturally to John, so in the summer of 1780 he began to question what he regarded as Franklin's overly solicitous posture toward the French government, thereby inserting himself into a conversation between Franklin and the French foreign minister (p. 87)." "Abigail did her best to suffer in silence, but her prolonged misery as a de facto widow occasionally seeped out (p. 91)." "John's diplomatic mission split the Adams family down the middle. The older boys, John Quincy and Charles, were with John in Paris, then Amsterdam, then Leiden. Nabby and Tommy remained in Braintree with Abigail.... It is tempting to claim that neither Abigail nor John could possibly know that they were launching a dynasty--arguably the most prominent family line in American history--but the evidence demonstrates beyond much doubt that they intended to do precisely that. John was not only obsessed with posterity's judgment, but also determined that his name would live on in the achievements of his children and then their descendants (p. 91)." "Abigail and John mixed quite demanding doses of discipline with routinized expressions of parental affection in their child rearing (p. 94)." "Because of John's diplomatic duties, they had been together less than four months over the past six years.... John...was so confident of her bottomless strength and devotion that it never even occurred to him that she harbored vulnerabilities that needed his attention (p. 107)." "The Adams-Jefferson partnership was destined to become one of the most consequential, tumultuous, and poignant relationships in American political history, with an ending that no novelist would dare to make up (p. 115)." "Jefferson's mind worked from the theoretical downward to the practical, starting with his own vision of the preferred policy, which was often quite visionary, then trying to make it fit the actual historical conditions...It was Jefferson's anticipation of globalization. John's thoughts flowed in precisely the opposite direction. He began with the assumption that nations viewed the international marketplace through the prism of their own sovereign interests...Jefferson's romantic prescriptions were surely beautiful, but their implementation must await arrival of the Second Coming, when all men became angels at last (p. 115)." "The gender categories that Jefferson carried around in his head envisioned men and women occupying wholly separate spheres. Abigail's androgynous personality confounded his categories (p. 118)." "In the absence of agreed-upon federal jurisdiction over foreign policy, America could not speak with a single voice in Europe (p. 126)." "It is clear that Abigail and John, who never owned a slave, regarded slavery as incompatible with the values of the American Revolution, and therefore an awkward anomaly that British critics of American independence liked to throw in their faces (p. 128)." "John's letters to John Quincy were full of diplomatic news, as if he were a junior colleague as much as a son (p. 129)." "'We will return poor...but if we can get you all through college, the World is all before you, and providence your guide (Abigail, p. 130).'" "'I do not regret that I made this excursion since it has only attached me more to America.' And, she might have added, to her 'dearest friend (p. 138).'" "A new chapter in the evolution of the American Revolution was beginning, a chapter in which an aspiring American nation-state replaced a loose-knit confederation of individual states. The question facing Abigail and John was whether or not to participate in this next round in the American experiment (p. 140)." "No one mentioned the fact that the vice presidency was largely a ceremonial office, ill-suited to his outspoken and passionate temperament, or, as he put it a few years later, 'the most insignificant office that ever the Invention of Man contrived or his Imagination conceived (p. 142).'" "No couple in the country was more experienced at managing the social obligations of political office than Abigail and John. Their diplomatic duties in Paris and London had provided an unmatched education in courtly etiquette at the highest levels of refinement. John recognized that Abigail was his greatest asset on the all-important social front... He needed her by his side (p. 143)." "According to the language of the Constitution, the vice president was allowed to vote only in order to break a tie and was required to remain silent during debates.... A minor matter of official etiquette prompted the first violation of his oath of office and made him the centerpiece of the first political controversy to afflict the new government. The issue at stake was an apparently harmless question: By what title should the president be addressed (p. 145)?" "So much for John's idealistic vision of the Senate as the arena for America's virtuous elite (p. 151)." "'The more one reads...the more one sees (John, p. 157).'" "'One great mistake in the education of youth...is gratifying every wish of their hearts (Abigail, p. 159).'" "Washington's reelection was assured... John's reelection was less foreordained... Despite opposition from New York and several southern states, which rallied behind Governor George Clinton of New York, John was comfortable reelected with 77 votes to 50 for Clinton. 'It does not appear,' he wrote Abigail, 'that I am born to so good Fortune as to be a mere Farmer in my old Age (p. 163).'" "While Abigail and John both agreed with the president on the policy of American neutrality, for at least three reasons that policy was much easier to proclaim than enforce (p. 165)." "It was an open secret that Jefferson, while serving as secretary of state in the Washington administration, was orchestrating the Republican opposition to the very government he officially serviced (p. 166)." "In January 1796 Washington leaked the news that he intended to step down after his second term as president. Although he had been hinting at his intentions for nearly four years, Washington's stature as the only self-evident truth in American politics made it difficult to imagine an American government without him as the centerpiece (p. 170)." "John had rather nonchalantly taken Hamilton's support for granted and vastly underestimated his ambition to control the Federalist agenda after Washington's departure. Hamilton must now be regarded as a rival (p. 174)." "John's predicament was rendered even more difficult by two political anomalies no president before or since has had to face. The first was the result of a flaw in the Constitution that made the runner-up in the presidential election the vice president. (This was corrected by the ratification of the Twelfth Amendment in 1804, which eliminated the awkward burden of a vice president who happened to be head of the opposition party.).... The second anomaly was the cabinet. One of John's biggest blunders was to retain Washington's chief advisors, a decision that he made without much thought and later attempted to explain as forced upon him by Federalists eager to convey the seamless transition from Washington to Adams. In effect, he somewhat lamely claimed that he lacked the authority to pick his own team. What he did not realize...was that three members of his cabinet--Timothy Pickering at State, Oliver Wolcott at Treasury, and James McHenry at War--were loyal disciples of Hamilton.... One final ingredient in the political chemistry, perhaps the most elemental of all, was John's distinctive personality. Despite his distinguished resume, he had no executive experience, had never commanded troops like Washington or served as governor like Jefferson. He was not equipped, by either temperament or experience, to delegate authority to subordinates or to manage them through a difficult decision-making process (p. 179)." "The second blow arrived almost simultaneously with the election results, and although they had been anxiously anticipating it as well, the news that Charles had died on December 1 produced emotional tremors that shook both parents to the core (p. 209)." "As it turned out, while it was clear that John had lost the election of 1800, it was not clear who had won. The same flaw in constitutional procedure that had made Jefferson his vice president in 1796 this time permitted Jefferson and Burr to tie in the Electoral College at seventy-three votes apiece. The decision was therefore thrown into the House of Representatives, as mandated by the Constitution, and eventually required six weeks and thirty-six highly contentious ballots to resolve (p. 210)." "On March 4, 1801, the day of Jefferson's inauguration, John boarded the four o'clock morning stage stage out of town. His absence at his successor's installation attracted criticism then, and has ever since, as a petulant gesture. More likely, he did not think he was supposed to be present. There was no precedent for a defeated candidate to attend the inauguration of his successor, and he wished neither to complicate Jefferson's moment of triumph nor to lend a hand in its celebration (p. 214)." "For more than twenty years Abigail had been urging her husband to retire from public life and join her beside the hearth at Quincy. Now, at last, he was finally doing so, albeit at the insistence of the American electorate rather than by any choice of his own (p. 214)." "Even John Quincy unwittingly disappointed his father by naming his eldest son George Washington Adams (p. 217)." "Abigail was attempting to manage what, by any measure, qualified as a dysfunctional family: Nabby and her little brood were living on the edge of poverty in a marriage sustained only by her unconditional loyalty; Sally Adams, widow of Charles, had become a permanent casualty of life, frequently breaking down in tears for no apparent reason; Thomas, upon his return to Quincy, retreated into self-doubt, chronic dissipation, and eventually a losing battle with alcoholism. Although the magic between Abigail and John remained intact, they were in fact surrounded by...human debris (p. 220)." "[Abigail] was the irrepressible center of gravity for the Adams family, and now all the accumulated loose ends floated into her domestic orbit. Ironically, it was her powerful domestic instinct that led her into an extraordinary exchange of letters with Jefferson, in which she became the most ardent and effective defender of John's political legacy (p. 228)." "Abigail was the only person on the historical record to confront Jefferson with the charge that he was a bald-faced liar. She did it with almost Jeffersonian deftness.... Jefferson presumed that this volley of letters with Abigail had occurred with John's knowledge and consent. In fact, Abigail had conducted the correspondence on her own (p. 231)." "If John's chief ambition was to live forever in the memory of future generations, Abigail's was to create the hard nucleus of a family that would do the same (p. 231)." "She and John had not only lived so much life together, they had also suffered so much pain together that it was impossible to imagine doing it with anyone else (p. 241)." Joseph Ellis has an amazing talent for introducing readers to the great figures of the American Revolution. He makes you feel as though you've lived in their homes, eaten family dinners with them, and become close friends. And perhaps none of his books do that so well as First Family: Abigail and John Adams. In contrast to the reserved and aloof George and Martha Washington, John and Abigail Adams left a small mountain of correspondence that bridge not only the time they spent apart but an ocean Joseph Ellis has an amazing talent for introducing readers to the great figures of the American Revolution. He makes you feel as though you've lived in their homes, eaten family dinners with them, and become close friends. And perhaps none of his books do that so well as First Family: Abigail and John Adams. In contrast to the reserved and aloof George and Martha Washington, John and Abigail Adams left a small mountain of correspondence that bridge not only the time they spent apart but an ocean as well. In their frequent and highly personal letters we get a narrative of America as it fights for independence and struggles to remain so. But we also get an intimate portrait of one of the most central families in the early years of the new nation, with the struggles they also faced as husband and wife and parents as well. And while Ellis has acknowledged that Adams is his favorite of the Founding Fathers, he doesn't shy away from revealing his immense vanity and hyperactive ambition. Instead he personalizes the man and his highly intelligent and capable wife, who provided an appropriate counterbalance in his life. 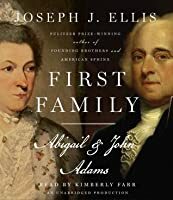 Joseph J. Ellis' book "First Family: Abigail and John Adams" is a fine tribute to that extraordinary couple and a pleasure to read! As the title suggests, the book is about the family as well as the President and First Lady themselves. Whether you are already a student of the Adams Family or a seasoned and veteran reader about the couple, Ellis's book provides plenty of material on which to ponder, and his analysis of the sources and reasoned speculation in the absence of them are superior. As i Joseph J. Ellis' book "First Family: Abigail and John Adams" is a fine tribute to that extraordinary couple and a pleasure to read! As the title suggests, the book is about the family as well as the President and First Lady themselves. Whether you are already a student of the Adams Family or a seasoned and veteran reader about the couple, Ellis's book provides plenty of material on which to ponder, and his analysis of the sources and reasoned speculation in the absence of them are superior. As interesting as John and Abigail Adams are - and they are a fascinating pair, I was intrigued by the author's treatment of their children. As Ellis points out, John Quincy was the only one to fulfill his parents' high expectations, as his siblings died early and often made poor decisions in their personal lives which limited what they were able to accomplish. Ellis includes a fine treatment of the famous Adams-Jefferson friendship, rivalry, and friendship again, and I never tire of reading about the two of them and their opposing ideas about the United States and what it should be. Like many, I suspect, I find myself in agreement with them both, depending on the issue under consideration. John and Abigail Adams are the original American power couple. Their 54 year marriage and partnership is something we should all strive for. Abigail Adams was an outlier in her generation a woman encouraged by her father and grandfather to read and participate in intellectual discussions though now common place was anything but for women in her generation. And she needed all that intellectual encouragement to take on the challenge of being married to John Adams. This great read from Joseph Ellis looks at this grand partnership and how it survived and thrived in the many years they were separated by vast distances while the revolution was created and conducted. John was either in Philadelphia or Paris and they communicated by letters that were saved by the family. These 1200 letters provide the story of the revolution and the early government from the Adams perspective. Abigail was John's true confident and main political advisor not until Eleanor Roosevelt do we see a first spouse as critical to their spouse as Abigail is to John. First, a note on the audiobook. The reader was a lovely choice for the book. I felt like she put a lot of personality into the words and really made the letters (written in an old-fashioned and self-conscious manner) come alive. I often notice repetitions on audio more than when reading, and this was true of this book, but it didn't take away from my enjoyment of the experience. This really is a story of a marriage, rather than the story of a Founding Father or early-American politics--though tho First, a note on the audiobook. The reader was a lovely choice for the book. I felt like she put a lot of personality into the words and really made the letters (written in an old-fashioned and self-conscious manner) come alive. I often notice repetitions on audio more than when reading, and this was true of this book, but it didn't take away from my enjoyment of the experience. This really is a story of a marriage, rather than the story of a Founding Father or early-American politics--though those can't be left out because it is John Adams. The relationship of John and Abigail is the central story of this book, the rest (politics and family problems, etc) is mentioned as a side note. As a story of a marriage, this was lovely. Abigail and John Adams were true love at its best--weathering hard times, separations, family issues, mood swings, and more, while still loving and supporting each other. Probably the best biography I've come across. Both John and Abigail Adams are singular in American History because of the volume of correspondence which they wrote and kept over the span of 40 plus years. Their insights about the Revolutionary era-(as well as both pre and post) and their well-chosen words make each letter a sparkling gem, putting the current generations' use of gangster talk and text lingo to shame. Ellis as a researcher writer kept his objectivity throughout the book, both prai Probably the best biography I've come across. Both John and Abigail Adams are singular in American History because of the volume of correspondence which they wrote and kept over the span of 40 plus years. Their insights about the Revolutionary era-(as well as both pre and post) and their well-chosen words make each letter a sparkling gem, putting the current generations' use of gangster talk and text lingo to shame. I love the books of Joseph Ellis and this one did not disappoint me. I've read a couple of biographies of John Adams and this read more like an historical novel rather than a biography. Of course it helps that half of the subject matter is John Adams' better half, Abigail. She's definitely one of the first feminists. Her partnership with her husband would be incredible at any time but was truly amazing in the 1700s. John Adams political career has of course been well documented. What makes this I love the books of Joseph Ellis and this one did not disappoint me. I've read a couple of biographies of John Adams and this read more like an historical novel rather than a biography. Of course it helps that half of the subject matter is John Adams' better half, Abigail. She's definitely one of the first feminists. Her partnership with her husband would be incredible at any time but was truly amazing in the 1700s. John Adams political career has of course been well documented. What makes this book special is that it tells us more than just the historical facts. Ellis discusses John Adams' thoughts and feelings regarding the events going on around him, through the letters that he sent to Abigail and to his son, John Quincy. It's fascinating to be able to know an historical figure so well, especially one who was willing to admit and talk about his own faults. i have to admit I was a little disappointed in Ellis' latest book about the Revolutionary Generation. I've read David McCullough's John Adams and Cokie Roberts' "Founding Mothers" and "Ladies of Liberty", and I found Ellis'depiction of the couple to be a bit different than what I had read. Frankly, I feel he doesn't give Abigail much credit. I left this book with the impression that she really pined for John when he was gone, as if she could barely function--and that doesn't match with what I've i have to admit I was a little disappointed in Ellis' latest book about the Revolutionary Generation. I've read David McCullough's John Adams and Cokie Roberts' "Founding Mothers" and "Ladies of Liberty", and I found Ellis'depiction of the couple to be a bit different than what I had read. Frankly, I feel he doesn't give Abigail much credit. I left this book with the impression that she really pined for John when he was gone, as if she could barely function--and that doesn't match with what I've previously read. Sure, she missed him. I'm sure her letters were filled with longing, but he could not have made it as far as he did if she wasn't capable of running the family farm and finances. Were I to sum up Joseph J. Ellis' 'First Family' in two words, they would be "nothing new". Any student of or expert on American history, amateur or otherwise, will have heard the vast majority of this story. The John and Abigail Adams story has already been told, much more thoroughly, by David McCullough. The introduction of First Family sets the goal of telling major stories of the Revolutionary era through the eyes of the first power couple in American history. The events highlighted in this b Were I to sum up Joseph J. Ellis' 'First Family' in two words, they would be "nothing new". Any student of or expert on American history, amateur or otherwise, will have heard the vast majority of this story. The John and Abigail Adams story has already been told, much more thoroughly, by David McCullough. A very fine work. This book focuses on Abigail and John Adams, and traces their lives together. In the process, we come also to learn about other leaders of the time from the Adams' perspective. John and Abigail were parents of four children, three of whom led rather tragic lives. One one child--John Quincy Adams--became president himself. The book examines the strains on their marriage--his service away from home in Congress or in Europe. The book speaks of John's temperamental peculiarities, w A very fine work. This book focuses on Abigail and John Adams, and traces their lives together. In the process, we come also to learn about other leaders of the time from the Adams' perspective. John and Abigail were parents of four children, three of whom led rather tragic lives. One one child--John Quincy Adams--became president himself. The book examines the strains on their marriage--his service away from home in Congress or in Europe. The book speaks of John's temperamental peculiarities, which sometimes caused him trouble. Other features: His role as president; the rekindling of a friendship with Thomas Jefferson aftert thew two had become hostile toward one another. I love John and Abigail Adams. Their letters to each other were so rich, lucid, smart, loving, and astounding. They had their flaws. Especially John. I enjoy reading about that. Peeking into people's private lives makes them more real, more approachable. And it gives me hope. "Let it once be revealed or demonstrated that there is no future state, and my advice to every man, woman, and child would be, as our existence would be in our own powe I love John and Abigail Adams. Their letters to each other were so rich, lucid, smart, loving, and astounding. They had their flaws. Especially John. I enjoy reading about that. Peeking into people's private lives makes them more real, more approachable. And it gives me hope. "Let it once be revealed or demonstrated that there is no future state, and my advice to every man, woman, and child would be, as our existence would be in our own power, to take opium." If you've read Revolutionary Era bios and histories, there is still new ground to tread in this book. It is the story of a husband-wife partnership unequaled among presidents until FDR & Eleanor, though Bill and & Hillary might be a more apt comparison in some ways. Joseph Ellis again hits the mark with his subject. If you've read McCullough's Adams bio, you already have a basis for going further with this one. I recommend you do so. The more I read about John and Abigail the more I am amazed. Their relationship is beautiful and inspiring. Their efforts on behalf of the revolution and flegdling US are incredible. The friendship between Adams and Jefferson, and the way they overcame some serious issues [Jefferson was awful to John] is astounding. At approximately 250 pages this book is a great quick read for someone that wants to learn about John and Abigail. For an amazing read try David McCullough's John Adams. An enjoyable biography of Abigail and John Adams. In the pantheon of our revolutionary leaders, the Adamses - and the importance of their marriage, love affair and partnership - are underrated. Relying heavily on personal correspondence between Abigail and John, as well as letters to friends and other public figures, Ellis chronicles their trials and successes, public and personal. Abigail Adams ! The best. Interesting read. The amount of time that John and Abigail had to spent apart is almost tragic, but it's given us such a wonderful view into their thoughts and lives.